Peer reviewed paper – wind contributes to Arctic sea ice decline | Watts Up With That? From Dr. Roger Pielke Senior, one more paper saying what we’ve been reporting on since 2007 – Arctic sea ice extent is a significant function of wind and currents, not just temperature. A science blogger named Tamino, in a post he made here, challenged me to “explain it or shut up” related to the loss of northern hemisphere Arctic ice this season which he claimed was …” undeniable, that it’s not natural variation” in contrast to the southern hemisphere Antarctic setting a new record for ice extent. While I suspect that sea ice is not his specialty, nor is it mine, I will bring some things to the attention of my readers available from literature. Just last Monday, NASA was quietly issuing a press release explaining why Arctic sea ice loss was so great this year. (h/t Douglas Hoyt). In fact, in 2009, in further factual explanation for Tamino’s demand that I “explain it or shut up”, I did another post that showed a movie of wind pushing the ice out of the Arctic. See Watching the 2007 historic low sea ice flow out of the Arctic Sea What is interesting about this video is that you can watch sea ice being flushed out of the Arctic sea and pushed along Greenland’s east coast, where it then finds its way into warmer waters and melts. Fast forward to today, now we have a peer reviewed paper on the issue. And, guess what, in this new paper they quantify it with a nice graph. It seems wind driven export of sea ice has been on the rise. Fig. 7. Annual mean Fram Strait sea ice area export values as driven by NCEP surface pressure difference. Values are averages for 1 September through 31 August. Dashed lines indicate the 95 % confidence interval of the trend. Linear trends are added onwards from 1970, 1980 and 1990 (different colours). Values from Kwok (2009) are added for comparison. Arctic sea ice area decrease has been visible for two decades, and continues at a steady rate. Apart from melting, the southward drift through Fram Strait is the main loss. We present high resolution sea ice drift across 79° N from 2004 to 2010. The ice drift is based on radar satellite data and correspond well with variability in local geostrophic wind. The underlying current contributes with a constant southward speed close to 5 cm s−1, and drives about 33 % of the ice export. We use geostrophic winds derived from reanalysis data to calculate the Fram Strait ice area export back to 1957, finding that the sea ice area export recently is about 25 % larger than during the 1960′s. The increase in ice export occurred mostly during winter and is directly connected to higher southward ice drift velocities, due to stronger geostrophic winds. The increase in ice drift is large enough to counteract a decrease in ice concentration of the exported sea ice. Using storm tracking we link changes in geostrophic winds to more intense Nordic Sea low pressure systems. Annual sea ice export likely has a significant influence on the summer sea ice variability and we find low values in the 60′s, the late 80′s and 90′s, and particularly high values during 2005–2008. The study highlight the possible role of variability in ice export as an explanatory factor for understanding the dramatic loss of Arctic sea ice the last decades. Sure, it’s wind…obviously with changes in wind patterns and wind magnitude that are due to climate change. Another daft question (I seem to be full of them today), but why is the “geostrophic wind” stronger now than previously? Note especially the changes in Arctic flow patterns going from a solar maximum to solar minimum in Figure 2 and Figure 7, that correlate with the “little ice age” in Europe. Of course the wind will blow icebergs around. brakes up ??? well, I get your point but how does this ice melt in water that is below freezing ? just curious ? I looked back at the older 2007 post. great post and I stumbled upon a question for those surface temperature color coded maps. How can anyone possibly show a temperature deviation from the mean for the polar regions? We can’t possibly have enough temperature data from these areas to have developed a scientifically significant mean? After all, they are both huge. The ocean currents also play a huge role. Even with zero wind water enters from the west and eventually exits in the east. The ice goes along for the ride at a rate of (If i recall correctly) over 2 miles per day. The most useless metric discussed in GW blogs is “multi-year ice” followed closely by “ice thickness. Multi-year ice is simply ice that got caught up in a circular ocean current (there are several in the arctic). In the dead of winter an ice flow can crack at the North Pole exposing fresh ocean which will freeze at a rate of several inches per day. But since the ice on the surface isolates the ocean from the cold arctic air the rate of new ice buildup quickly declines. Thicker ice is ice that is caught up in circular ocean flow. And “thicker” means a few feet thicker than average not 2X -3X average. It seems the general public (encouraged by dishonest “scientists”) assumes the ice just sits in the arctic and accumulates. As several multi-month films show this is simply incorrect. Ice in the arctic is on an ocean current conveyor belt that makes a joke of the focus on multi-year ice as a metric of global temperature. Heh, I remember making a request for such a study in a comment here on WUWT. WUWT is influential and read everywhere. I seem to be commenting a lot today, however, much of this info is related to ice, a Canadian staple. Wind and drifting ice is normal news in my part of the world. Moreover, wind creates waves and sea direction creating a double hit on breaking up ice. Anyone remotely familiar with the long history of Newfoundland sealing is intimately familiar with the power of wind driven ice, the countless deaths related to wind/ice/and current is legendary in the eastern part of Canada. Until you’ve seem the power of five hundred miles of wind driven ice most have no knowledge of the mass and power behind this phenomena. Trust me you very quickly learn to fear that power – you aught to see that power hit land and begin piling up. That power can tear ice to shreds going back the opposite way and pile both above and beneath sometimes reaching down to the ocean floor itself as the only way to stop that mass. Thought that part should be said again for all of your readers who claim the Artic has not been losing ice. I don’t really know what is going on up there. However it seems to me that the winter ice is not freezing as solid as it has in the past. Nobody is debating that the amount of ice in the arctic is less than it was in the past. The underling point of this blog is to have a reasoned discussion concerning how or why things are changing in out climate at faster rates than in times past. Human activity is greater now than at any other time in our history. There are more of us. In the last one hundred years the single change on this planet is our population. put more stuff in a given space and let it be more energetic. The result we be a temperature increase. Simple cause and effect studies point towards humans as the change generators. The studies chronicled in this blog and others are busy with details. And like Nero it is out of our hands. I am a bit startled at the idea that this wind theory is a new revelation. In my article carried here’historic variations in arctic ice’ I cited various books from the 1820’s onwards that came about as a great age of exploration opened up as the Arctic ice melted. Might I remind you – 29% of Earth is land mass. Of that 29% humans occupy less than 1% of that area. Of the remaining 28% about 40% is pure wilderness. 14% is true desert and 15% has desert like characteristics. 9% is Antarctica. Most of the remaining 22% are agricultural areas. There may be other areas with a human footprint of some kind but it is insignificant in any relation to global warming. It matters not what only the Arctic Ice Cap is doing. What matters is how the world’s total inventory of ice is changing; is it decreasing, stable or increasing? To look only at the Arctic is as short sighted as looking off the coast of North Carolina to project global sea level change. It also matters not that some glaciers are melting. Since we are at the end of the present Interglacial, all glaciers should be melting. That’s what glaciers do during Interglacials. In that any glaciers are growing – and way too many are – should be considered disturbing. 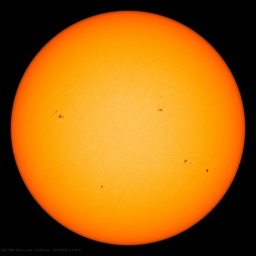 How long will it take for “consensus” science to acknowledge that the Landscheidt Grand Solar Minimum (totally predictable from celestial mechanics) is underway, shortages of food and fuel are in the wings, and no amount of warming from CO2 is going to save us? I seem to recall Dr. Meier noting another study here a year or so ago that also concluded that 2007 was around 30% wind-driven. So I’m not sure this is all that new, tho still nice to have. But a related important question, is to what degree is this increase in wind-driven export of ice essentially a “positive feedback” of heat-driven ice thining? To me, it seems quite likely that thinning of ice, and increase of so-called “rotten ice”, makes it significantly easier for wind to play an increased part in exporting ice south. @ TonyB – kinda like how we’ve know that CO2 is a significant GHG. Tyndall set out to find whether there was in fact any gas in the atmosphere that could trap heat rays. In 1859, his careful laboratory work identified several gases that did just that. The most important was simple water vapor (H2O). Also effective was carbon dioxide (CO2), although in the atmosphere the gas is only a few parts in ten thousand. Just as a sheet of paper will block more light than an entire pool of clear water, so the trace of CO2 altered the balance of heat radiation through the entire atmosphere. Note that the paper does not yet appear to have passed through the full open review process used by The Cryosphere. It’s about time! Actually, Arctic sea ice extent is declining due to the combined effects of wind and icebreakers full of climate scientists, looking desperately for their next grant…. I read this post on Dr. Pielke’s blog with some interest. While I found the “it’s the wind” argument compelling, without comparing it to historic data, the wind argument itself really proved nothing. Since wind driven ice loss could have been the case also when ice was at recent decadal maximums, it could have been other factors responsible for the “record” declines. One needs to compare wind driven losses for the past and the present in order to get a handle on whether this is a factor in declines, or whether it is just a constant that does not change what causes minimums and maximums. This paper gives credence to the theory that the minimums may be a result of wind, and not temperature (atmospheric or water). Very good read. I have my own theory of fluctuations in Arctic ice, which is mine. So what follows is MY theory. By me. (ahem) My Theory of What Causes Fluctuations in Arctic Ice, by me, TrueNorthist. And it is as follows. First, the ice gets reeeeeeeaaally thick when it is cold, and gets reeeeeeeaaaallly thin, when it gets warm again. And then the wind blows it away. OK. So I added that last bit a minute ago. Still, pretty amazing. Thank you. Might I remind you the approximate CO2 in the atmosphere is 380 PARTS PER MILLION. Scientists traditionally write 0.038% as 0.000380. Taken from James A. Peden: Carbon dioxide absorbs infrared radiation (IR) in only three narrow bands of frequencies, which correspond to wavelengths of 2.7, 4.3 and 15 micrometers (µm), respectively. The percentage absorption of all three lines combined can be very generously estimated at about 8% of the whole IR spectrum, which means that 92% of the “heat” passes right through without being absorbed by CO2. In reality, the two smaller peaks don’t account for much, since they lie in an energy range that is much smaller than the where the 15 micron peak sits – so 4% or 5% might be closer to reality. If the entire atmosphere were composed of nothing but CO2, i.e., was pure CO2 and nothing else, it would still only be able to absorb no more than 8% of the heat radiating from the earth. The Russians have been saying that for ages. As has been extensively discussed in various threads here in the past, there need be no “forcing” to cause warming (or cooling) to occur. Unforced warming is inherent in a chaotic system that is constantly chasing an ever-elusive equilibrium point–one that its chase itself disturbs. As an example, the century-length upward and downward temperature surges of the past few thousand years occurred without any outside intervention. There is no reason to think that the upward surge of the past 150+ years, which is so far smaller than the MWP & the Roman Optimum, is unlike those prior unforced warmings. Anthony posted my video’s here also. It is the wind effect that became so obvious in my videos as well and I can say without reservation that it solidified my opinions about sea ice. We could see the trend year after year and knew without severe corrections the melting was obvious. Then I plotted the daily data in the full length video published at WUWT. It became apparent that sea ice is simply ice, in the sea, affected little by air temps and greatly by ocean flow. That should be no surprise at all considering the energy content of each. Of all things climate, sea ice decline due to AGW is in the top three of which I am most skeptical. Here is an updated animation that Rigor made about a year and a half ago. The inclusion of the buoy drift tracks makes it fairly easy to see the dramatic change in the BG and the TPD in the late 80s. I have seen no reasonable argument that these circulation pattern changes are in any way related to anthropogenic CO2 emissions. The strength and direction of prevailing winds can indeed accelerate the flow of ice out through the Fram, especially when they are reinforcing the prevailing surface currents as happened in 2007 but, if more than six decades living on the banks of the Mississippi River have taught me anything, it is that when push comes to shove current beats wind every time. The change in the direction of the Transpolar Drift Stream which occurred in 1989 from flowing mostly parallel to the Lomonosov Ridge to following the prime Meridian almost exactly, along with the accompanying changes in the radius of the Beaufort Gyre are able with the wind patterns described in this work to account for the vast majority of changes in Arctic sea ice which have been observed in the recent past.. In the continuing climate tragedy of declining Arctic sea ice the alarmists would like to cast CO2 in the role of Hamlet, but most evidence suggests CO2 is only fit to play Rosencranz or Guildenstern, or if reason and logic ever do prevail again its real perfect role as “poor Yorick”. You have any other explanation. A bicycle gets the caloric equivalent of ~1000 miles to the gallon of gasoline. When we burn 10 gallon a day in addition to the food we eat anyway the energy use is exponentially huge. Add a little soot and voila! But a related important question, is to what degree is this increase in wind-driven export of ice essentially a “positive feedback” of heat-driven ice thining? My understanding of the paper is that the long term trend is derived from a linear relationship between ice export and wind found in recent years. Any positive feedback, if it exists and it might, won’t be found by this sort of analysis. There is an implicit assumption that going back decades that the relationship is linear, that may be wrong of course. In part of the paper they suggest that ice export in spring may be a predictor of minimu ice extent in september. It would be good to see this put to the test. A prediction to Arcus would be interesting. jim, its working just fine. People are much better off today than they were then. Humanity’s lives are much easier, we’re fed better, we still have plenty of space to grow, we live longer, we’ve eradicated diseases and continue to work toward more eradication. While the earth per capita has more food we continue to make progress toward making even more per captia. The world’s education is significantly improved, in fact, in every meaningful and measurable way, we are much better off than then. We’re fine, and it appears we will be fine for many centuries to come. (Save for the obvious misanthropy we see today and the moral decay we witness.) Yes, we’ve still a long way to go, but just because someone sees a monster in a closet, doesn’t mean there’s a monster around every corner. BTW, invention doesn’t spring from the desires of paranoid fanatics, it comes from necessity. Our energy use will change when necessary, and not before, in spite of all of the wailing from the Malthusians. The Geostrophic Wind is an abstraction that can be calculated when the pressure is known and the actual wind is not known from measurement. In the area of study the two should be close. The question about “stronger” may be misdirected. The position or displacement of the high and low pressure zones may be the key to “stronger” winds in one place relative to another. Consider the case of the shifting high pressure that sometimes brings strong winds to southern California (the Santa Ana Wind) on a seasonal basis. It isn’t hard to contemplate a shift in the cause (location of high pressure) to a shift in the effect (location of strong winds). Not having read the paper, I don’t know what has been presented as an explanation – or if one was. Your stream of non sequiturs adds nothing to the topic. Most of us agree the Arctic is in a down cycle of ice. There have been papers posted that show that sea ice concentrations have been even lower in this interglacial. It’s cyclical. […] if you could run a chain between Svalbard and Greenland you could change the climate, but that’s a bit foolish. After reading of all the other recently proposed geoengineering dreams to change the climate, my foolish proposal sound rather tame. Figure 2 is not consistent with observation. The conceptualization is fundamentally flawed. jim, you are free to try out your personal solution to whatever it is that is bothering you [not “we”]. Let us know how it all works out for you. jim, its working just fine. Yes, we’ve still a long way to go, but just because someone sees a monster in a closet, doesn’t mean there’s a monster around every corner. BTW, invention doesn’t spring from the desires of paranoid fanatics, it comes from necessity. Our energy use will change when necessary, and not before, in spite of all of the wailing from the Malthusians. Hear rip-roaring Hear! Modern energy tech has a vastly smaller and more readily controlled impact per capita than the crude wasteful technologies of yesteryear, all the way back to burning forests for warmth and cow dung for cooking. And some fantastic new sources are coming down the pike, nothing whatsoever to do with diffuse and expensive “resources” like wind, wave, and sun. jim’s bucolic dreams are nightmares in practice. 1) Use PIPS 2.0 and look at the ice displacement and ice thickness, to see movement and ice packing in the Arctic Ocean. to observe day to day changes in ice flow and packing. Driven ice is called “ivu” by arctic circle natives. It is multi-year ice that is driven ashore by wind and currents. It can pile up to the height of six story buildings. There is no reason to believe the same forces cannot stack ivu in ridges far out at sea. All that is required is the presence of ice and a bit of wind. Add an immoveable object such as a long fetch of locked sea ice and you have ivu. While ivu that come ashore are witnessed, those that happen far out to sea are not. Doesn’t mean they don’t happen – it only means nobody is around to see it. Ive are to northern people what tsunami are to the rest of the world. Dangerous, sudden, fast moving, deadly. To paraphrase a young member of the Donner party – if you see signs of ivu, don’t tarry along the way. Strong winds will reduce ice cover but increase thickness. Formation of ice ridges is the start to blocks being pushed over others. Area shrinks thickness increases. Ice volume stays approximately the same. Three major solar cycles in a row and a tad more ocean heat, changed wind and changed currents are the reaction of a world chasing its tail in trying to reach equilibrium. It is called weather and wether it melts ice or not is entirely up to the world and our choices are rather limited. The more open water only means more cooling of the oceans it certainly has diddly squat to do with Arctic air temperature. Add +5 to -20 and try and melt ice. The cooling of the oceans is not particularly propitious for the near future with the sun in a funk. The warmist cause is not helped by the wishing of the Arctic to melt as it may leave them up sh*t creek in a barbed wire canoe without a paddle. My take is that the poor old world at the moment is caught between a rock and a hard place, the lag in the system is fighting previous solar inputs and now has to cope with a change, The lag will cause an over compensation that is reinforced by the changed new parameters, thus a period of cool or maybe cold for some decades. This also explains warm periods when parameters are reversed. Cyclical solar and celestial period. If the globe cooling, particularly in the high latitudes, wind would increase. Not only would this move ice, but wouldn’t the winds evaporate ice? I am fascinated by historical references to sea ice coming south of iceland. could sail to the pacific? Many thanks for the excellent link to http://www.eike-klima-energie.eu/uploads/media/Moerner_Science_environm_sea_level_3_11_Paper_534.pdf by Nils-Axel Mörner. While I agree with this statement the implication of your presentation is misleading. While the warming may be insignificant compared to GHG warming of the entire atmosphere, the effect on on-the-ground temperature sensors and very near surface temps is not trivial. An excellent paper. Keep it up. Geo, the extent to which it is a positive feed back is the extent to which melting draws heat from the air. Another issue that should be looked at is the historic ice breaker traffic through this area. Has increased ice breaker traffic broken up the ice and made it easier to flow (be blown) south? Marcel Leroux already explained this back then. That wind and ice export through the Fram Strait change over time (and may have increased during the period in question) is hardly something new and has been studied for quite some time, but the notion that wind and ice export explains ALL the sea ice changes in the Arctic seems to be a favorite among skeptics. There is just one slight problem with this idea…and that has to do with the fact that permafrost is melting as well, and it’s really hard for the wind to get underground to melt that permafrost. And the melting of permafrost makes sense if you believe the data that shows a gradual arctic warming of both air and water over the past few decades. If you believe the data, then you can easily see how the permafrost could be melting, and the sea ice declining, and it all would not preclude the data that shows wind and ice export through the Fram strait could also be increasing. All these events could have a related cause such that their simultaneous existence makes sense. But no matter your perspective on AGW and the long-term sea ice decline, at least understand that many factors are at work in the dynamics of causing this decline, and while export of ice and wind explains part of it, it is only part, and widely misses the mark of explaining the many changes going on in the Arctic. Beginning in the late 1990s, sea ice began melting in the southern arm of the gyre, thanks to warmer air temperatures and more extensive summer melt north of Alaska and Siberia. Moreover, ice movement out of the Arctic through Fram Strait continued at a high rate despite the change in the AO. 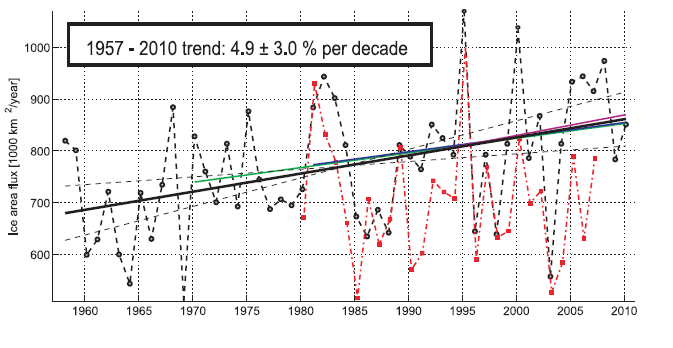 Thus warming conditions and wind patterns have been the main drivers of the steeper decline since the late 1990s. The influence of wind on sea ice extent is also discussed on other pages, including NSIDC’s FAQ section, and you can read about it in numerous publications. No, but it does take time to unlace misrepresentations of scientific understanding. The lead author of the paper cited above, and one of the co-authors, projected in 2008 that the Arctic would be 95% ice free in summer by about 2050. I wonder if their new paper would amend that projection.